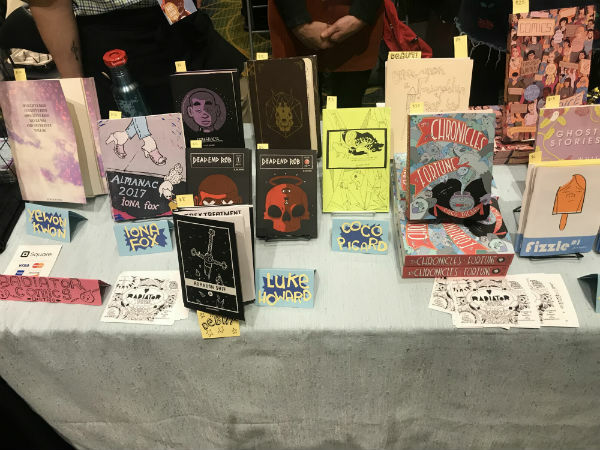 SPX‘s importance as a small press comics convention in North America cannot be overstated. The reasons have less to do with business and more to do with its consistent geographic location and place on the calendar. This consistency turns the show into a sort of New Year’s for the scene; a chance for cartoonists to reflect on the year that has been and the year to come. The long-time attendee will have their entire history of crucial moments spent around other cartoonists in that space collapsed into the present while the first-time attendee is greeted with a bombastic celebration of the medium loaded with new discoveries both artistic and social. 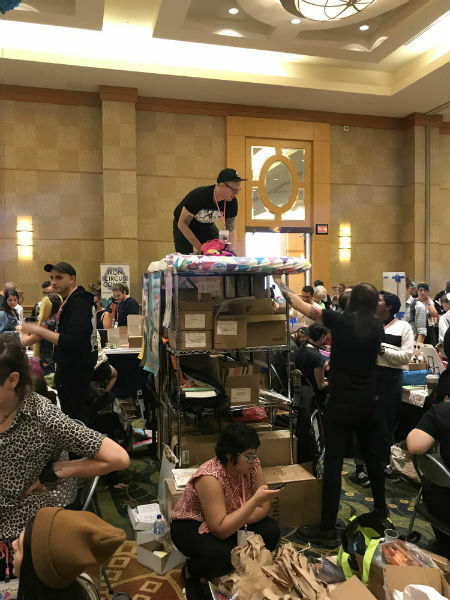 This year’s SPX however, was a reminder that even the safe summer camp bubble that the show creates is not entirely free from the troubles of the world outside it. It is a difficult thing to put into words what SPX has come to represent for cartoonists. 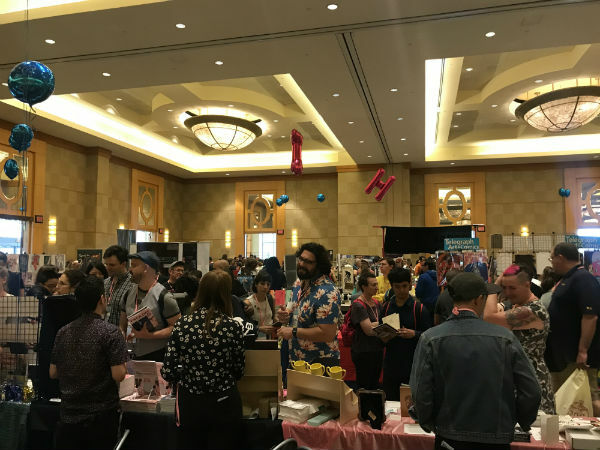 The size of the show, clocking in at over six hundred exhibitors this year, means that a substantial portion of small press comics creators from across North America are present. For a younger cartoonists like M. Sabine Rear (Portland, OR) the show’s size and import likely justifies the costly journey from the west coast. Though even an indie comics veteran like Rina Ayuyang (Oakland, CA) had never been able to make it SPX until this year due to that same distance. Part of what is so special about the show is that it is often the only time a cartoonist might get to catch one of their peers in person. The chance of turning an online friendship into something closer, or to keeping the flame of a long distance friendship alive for another year, gives the show floor an added emotional charge. 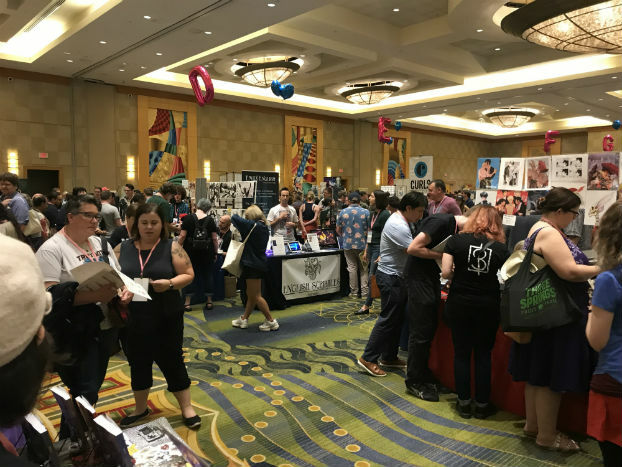 While many large conventions serve a similar role in enforcing the social bonds between cartoonists, SPX’s location far from the Washington DC city center incentivizes exhibitors staying on hotel grounds. Any hierarchy that might exist among cartoonists quickly erodes when there is only one small bar and patio to congregate at after the show. A cartoonist can feel right at home talking shop or telling ridiculous stories of conventions past over drinks, even among their vastly more successful peers. This erosion of strata is a subtle subconscious reminder that the world of small press comics is both a small and tightly held one. An interesting side effect of this baked-in community atmosphere was that despite concerns that the weekend would be adversely effected by inclement weather from Hurricane Florence, many attendees still braved the trip out. SPX was fortunately unbothered by the weather, though regular exhibitor Keith Knight was unable to make it as his home was in the path of the hurricane. Still, among cartoonists there seemed to be a certain romance to the idea of being trapped in a hotel all weekend with dozens of one’s compatriots even in emergency conditions. The willingness of members of the community to be put in a position to lash themselves together in the face of an actual maelstrom hints at much of the underlying mood of that weekend. Far heavier on the minds of attending cartoonists were several major disruptions to the comfortable order of the indie comics community. One major concern for attending creators was the growing role of ComiXology and its parent company Amazon as sponsors of SPX. It’s a pairing that rubs many cartoonists the wrong way, particularly due to widespread reports of Amazon’s poor labor practices. Many also felt queasy at this growing corporate presence in a space that has long striven to distance itself from such grabbing hands. That Amazon is trying to make inroads with their print-on-demand service into a community built around controlling the means of production and cutting out middlemen feels tone deaf at best, colonialist at worst. The only positive chatter about this jagged alliance seemed to focus on the potential for using Amazon’s digital reach as a means to get indie comics into the hands of readers who would never be able to attend a convention like SPX. It’s a difficult tightrope to walk between cartoonists wanting to protect their closely held community while simultaneously wanting to expand their cultural footprint. Cartoonist and writer MK Reed (Portland, OR) got at the heart of this quandary by posing the question whether Amazon’s digital platforms could be used to get adult women to read comics, especially those by other adult women? As more and more established indie cartoonists approach their 40s this question will take on larger and larger significance. 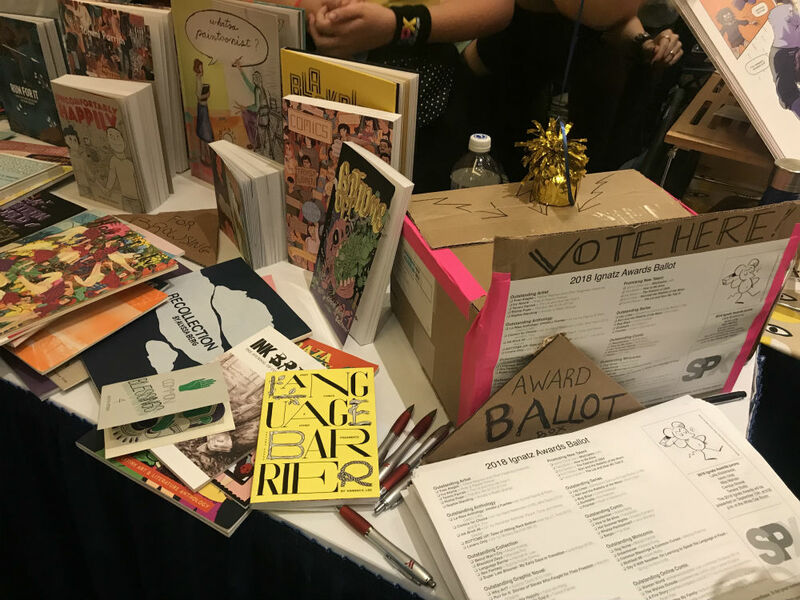 This question of the place of older cartoonists within the scene became a topic of some controversy following this year’s Ignatz Awards. Though the demographics have been shifting for some time now, this was the first year in memory in which almost all of the presenters, nominees, and winners were younger creators. Whereas a decade ago the stage was primarily filled with cartoonists whose creative hey day was in the ’90s. This focus on younger talent also brings with it likely the largest representation of LGBTQ and People of Color ever both on stage and in the Ignatz audience. So it was it not entirely surprising that when the always outspoken Ben Passmore commented on how in the past it would be an artist like Robert Crumb who was up for an Outstanding Artist award, Crumb’s name was met with a chorus of boos. While some took this as an insult to the work of indie comics forbears, for others it was a cathartic expression of a long-standing desire to distance the medium from its problematic past. Both sides of the debate though showed the utmost respect for presenter Carol Tyler, who reminded the audience of the passion and strength it takes to make comics a life’s work. On one issue the entire community was united, that being the pending litigation for 11 cartoonists being sued for defamation by comic artist Cody Pickrodt. The Comics Journal covers the particulars of the case both here and here. While rarely the subject of conversation on the show floor, due respect was given to those who had bravely spoken out by all their fellow creators. 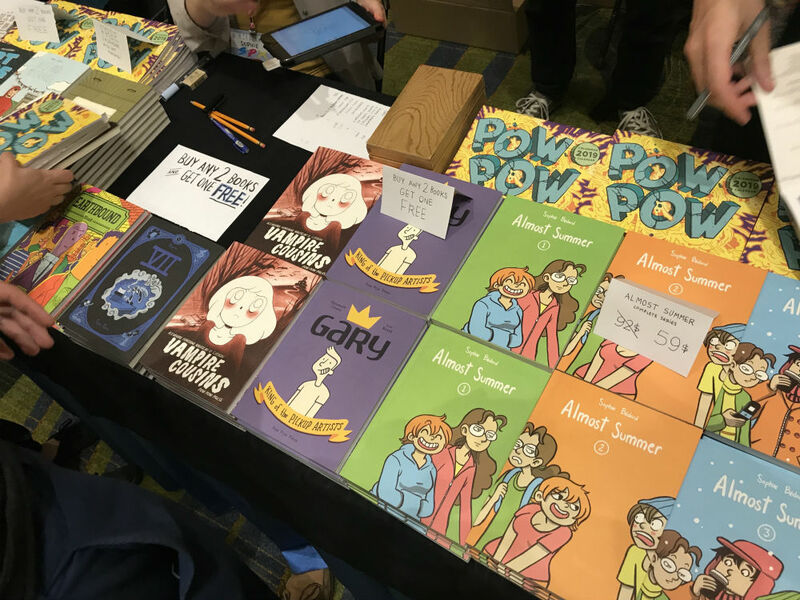 However, it was SPX’s helming of and generous donation to a fundraising effort for the legal defense fees of the 11 defendants that made many cartoonists feel that those in positions of power are as concerned with the stability of this community as they were. 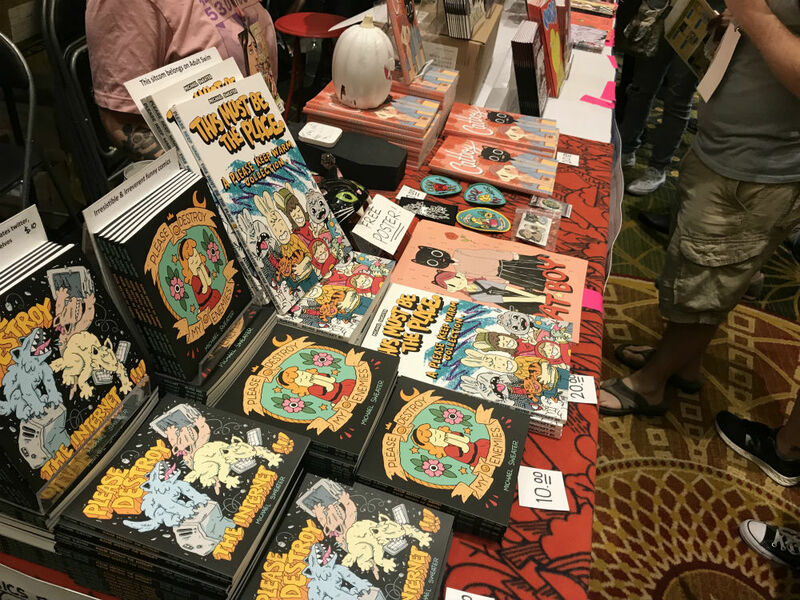 As SPX usually functions as a fundraiser for the Comic Book Legal Defense Fund, this did much to assuage the frustration the community felt about the CBLDF’s hesitancy to take action with regards to this case. The matter is far from resolved, but the fact that the on going fundraising effort is still lively only further reinforces the message that this community can and will band together in times of crisis. 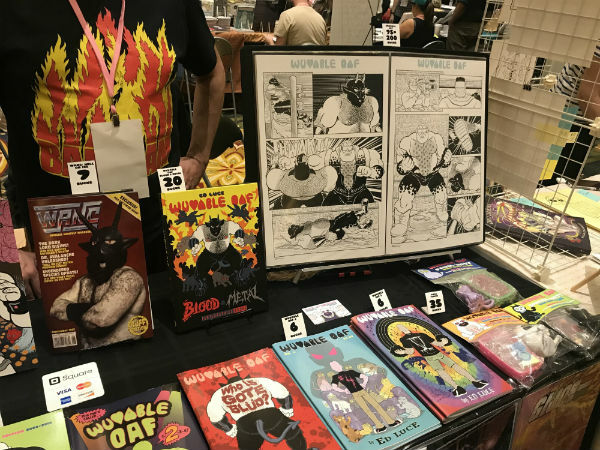 Despite all the behind-the-scenes challenges facing the North American indie comics community, the positive energy on the show floor was infectious. Even the most well versed fan of the medium could be exposed to something they had never seen before amidst the staggering volume of work on display. 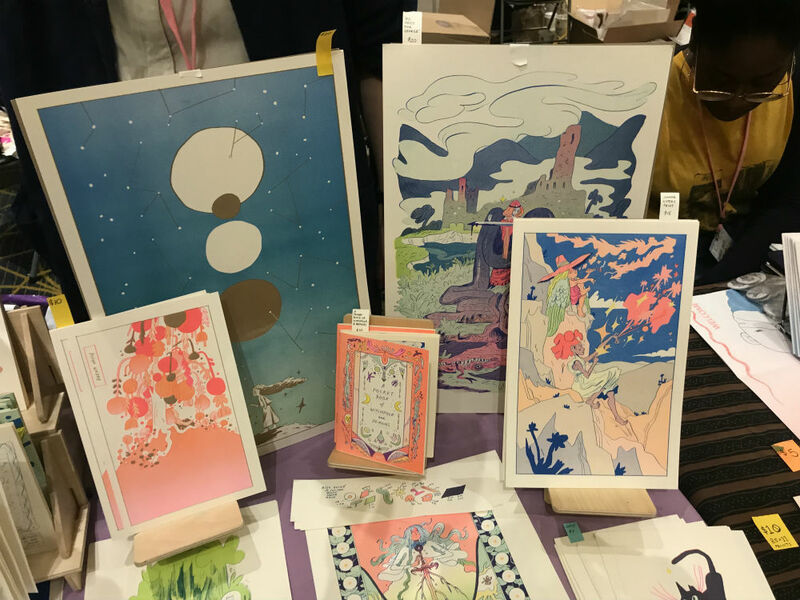 Creators like A.T. Pratt (New York, NY) got to debut their work to a whole new audience, while Montreal based Pow Pow Press made SPX their American debut to coincide with the translation of a large part of their catalog into English. An entire aisle of the convention floor was taken up by a combination of the artists represented by breakout publisher Silver Sprocket in combination with equally relevant Czap Books, and a loose collective of super vital and emerging New York cartoonists such as Vreni Stollberger, Ignatz nominee Kat Fajardo, and Ignatz winner Iasmin Omar Ata. Even the table-less cartoonists crammed 5 to a hotel room trading their first hand made ‘zines out of their bags came away with new comrades and a stronger connection to the scene. The talk of the show was of course the appearance by Steven Universe creator and long ago SPX alum Rebecca Sugar. With the shifting demographics comes a huge shift in who the sought after artists are at these events. The presence of such important and rarely seen cartoonists as Emma Rios, Fiona Smyth, and Julie Doucet was barely a blip on the radar of the mass of attendees in their early 20s. 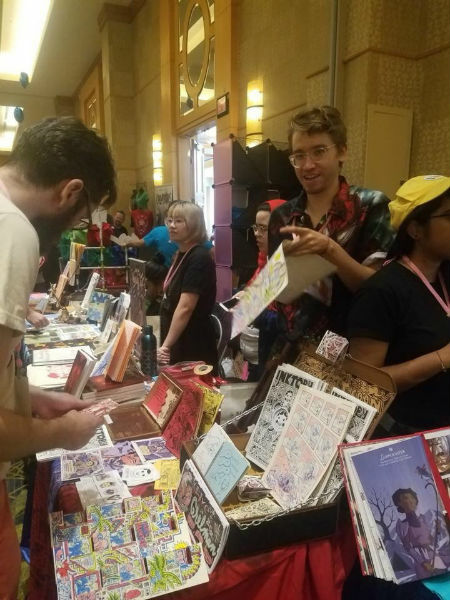 Several young cartoonists who had made their first pilgrimage to SPX debated whether it was worth standing for hours in line to speak to Sugar. Fortunately, and with some cajoling, they chose instead to forego the line and instead engage with the artists who were more readily available. A final note should be given to an event that wasn’t listed in any of the official programing but which encapsulates the magic of SPX. In a small ceremony in a tucked-away conference room before the Ignatz Awards, Michael Sweater married his partner Benji Nate surrounded by fellow cartoonists and friends. Cartoonist friends who had created a one-of-a kind-comics anthology celebrating the two, which was given to them as a wedding gift that evening. 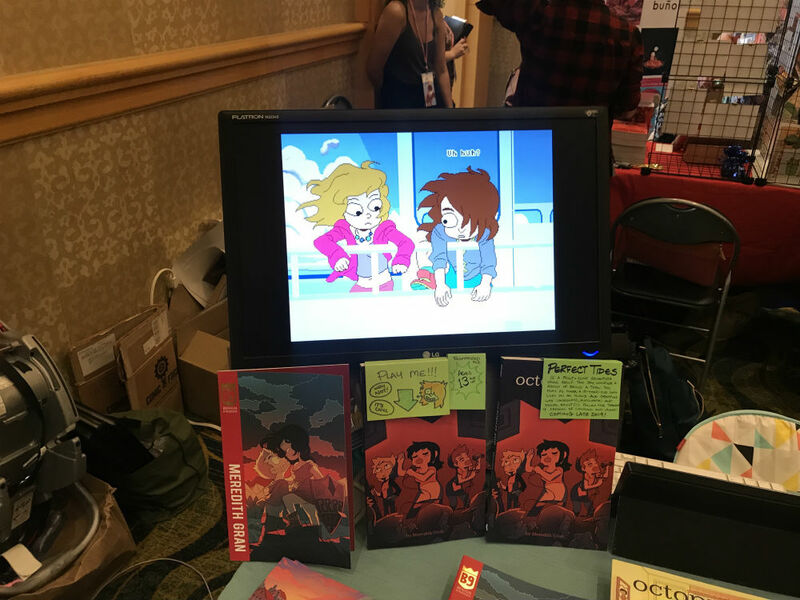 That such a deeply important moment in two cartoonists’ lives would be held at a convention says a lot about the place SPX has in people’s lives. Like all conventions it is where creators go to promote and sell their work, but more than any other it is where cartoonists go to be with cartoonists. To celebrate not only the love they have for the medium, but for one another. Follow SPX on Twitter here.